from 10:00 am to 12:00 Pm of December 31, 1999. 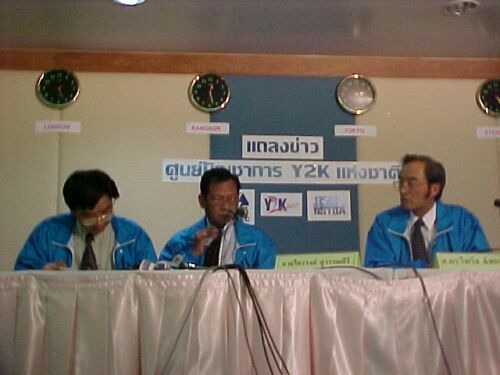 Summary of Y2K reports from around the world at 9:00 PM Thailand time indicated no Y2K problems arising in countries including Australia, Kiribati Island, Japan, Philippines, Taiwan, The People Republic of China and Singapore. Thailand Y2K situation report summary update from 10:00 am. to 12:00 pm. All incidents report calls were monitored and co-ordinations were made to concerned government departments and public enterprises. A total of 112 incidents and problems were resolved. Most incidents called to The National Y2K Command Center involved the problems with malfunction of the telephone handset for example, unable to connect to particular telephone numbers or mobile phone. Forty two calls can be categorized into this category. A total of 29 telephone calls involved malfunction of household utilities such as water supply and blackouts. A total of 6 calls involved reports of financial related problems. 3 calls involved transportation related problems. 32 calls involved problems related to personal computer and household electric appliances. Of the 682 calls, 104 calls were responded by The National Y2K Command Center though coordination with other government agencies who help identified that the problems were not Y2K related. In addition, The National Y2K Command Center also received Y2K reports from 39 other Y2K centers around the country that were operated by government agencies, state enterprises and major telecommunication companies. All reported no Y2K problems.